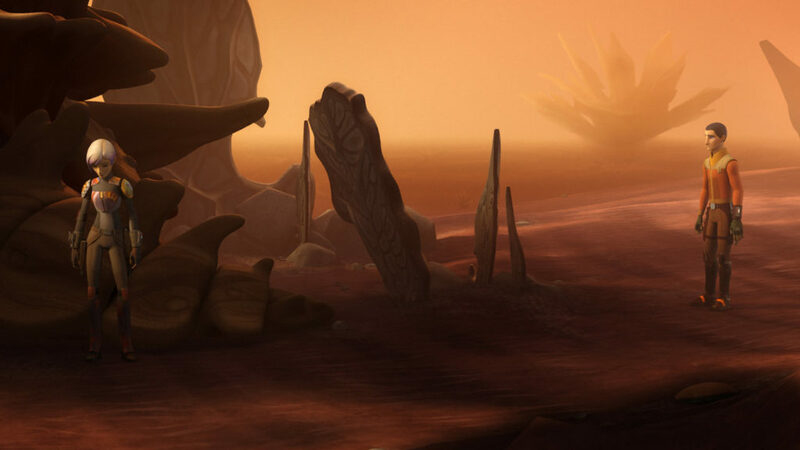 Sabine fights her feelings, her past, and the future she’s known she has to face — one way or another — after the events on Dathomir. All this, plus Darksaber training, in the excellent “Trials of the Darksaber.” Here are my 10 favorite moments from the episode. 1. The story of the Darksaber. 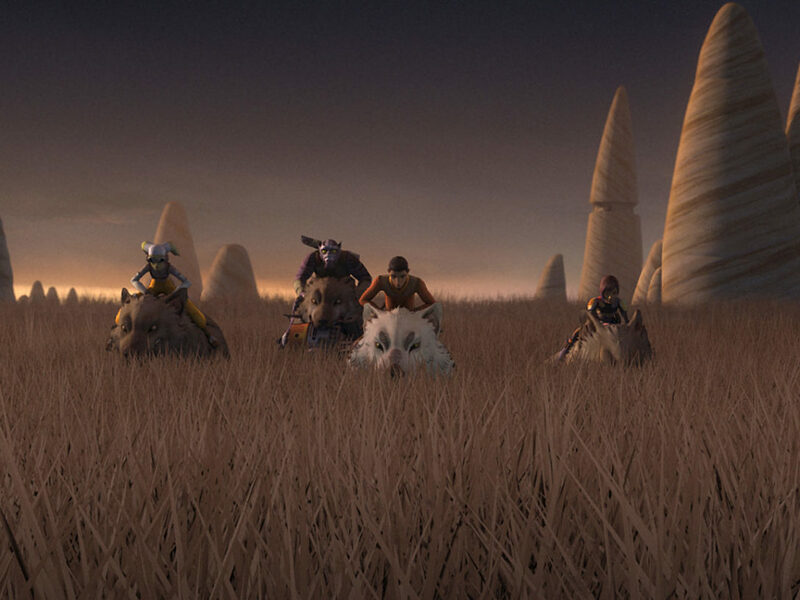 Hearing about the history of the Darksaber and the story of Tar Vizsla was already cool, but the animation style took this moment to the next level. 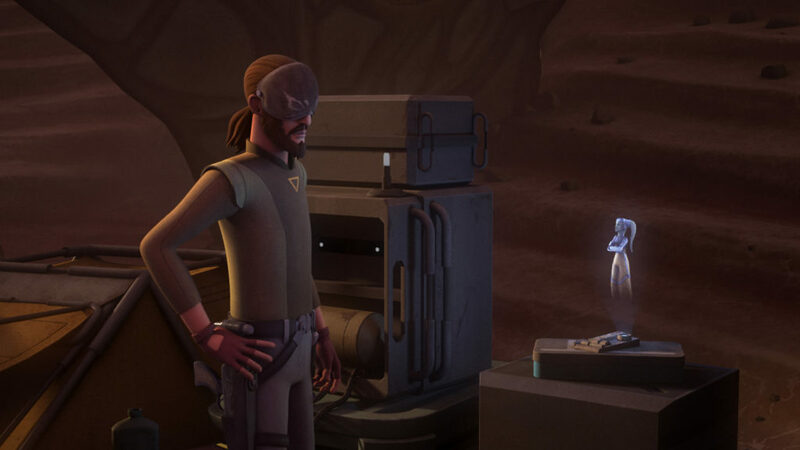 Additionally, this is another instance where a character from Legends makes their way into Rebels in a new and interesting way. 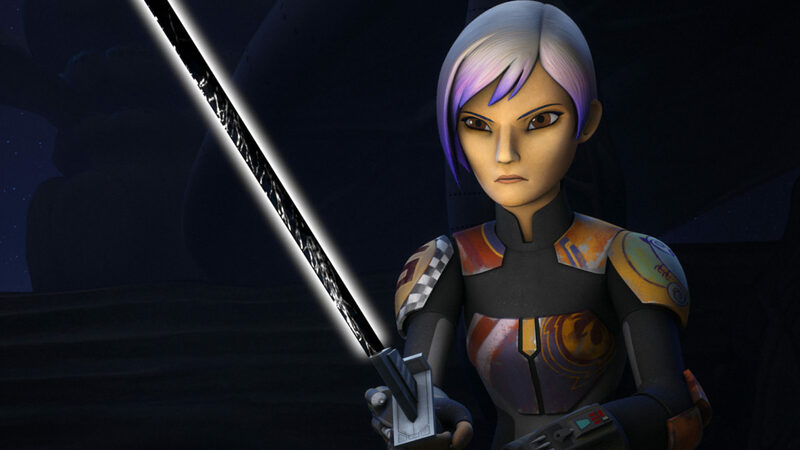 Simply possessing the Darksaber has implications for Sabine Wren of Clan Wren, part of House Vizsla. 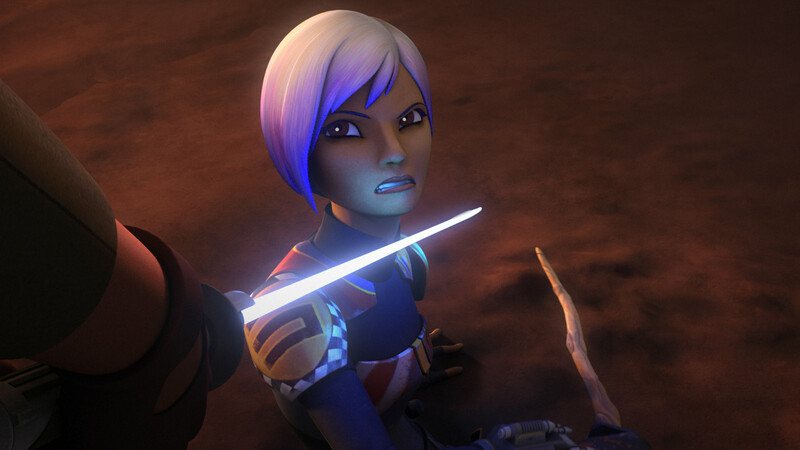 But it takes on an even deeper meaning when she’s asked to use it to help bring more Mandalorians to the Rebellion. Most specifically, the family she’s been accused of shaming in the past and has been cast out of. 3. Sticks, vambraces, and learning lessons the hard way. 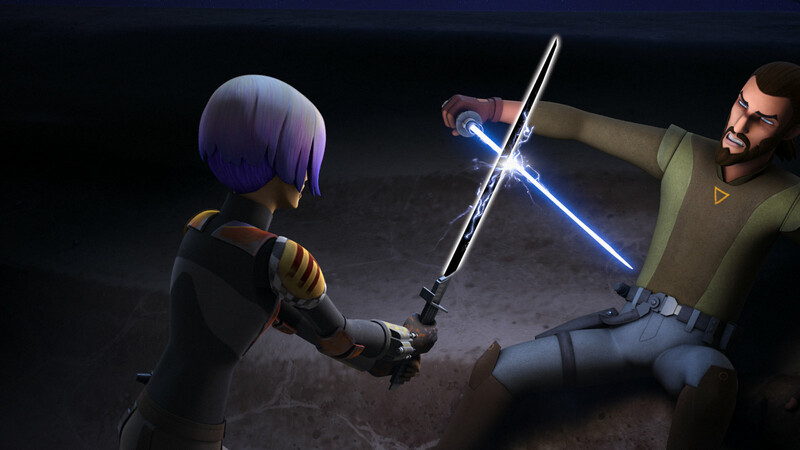 Kanan sets up a camp for Sabine’s training and then proceeds to give her quite a lesson using a training saber stick. Even after days of practicing forms, Ezra beats her. When Fenn Rau brings her Mando vambraces to even the score, it doesn’t go as expected. 4. Sometimes, there are no words that help. 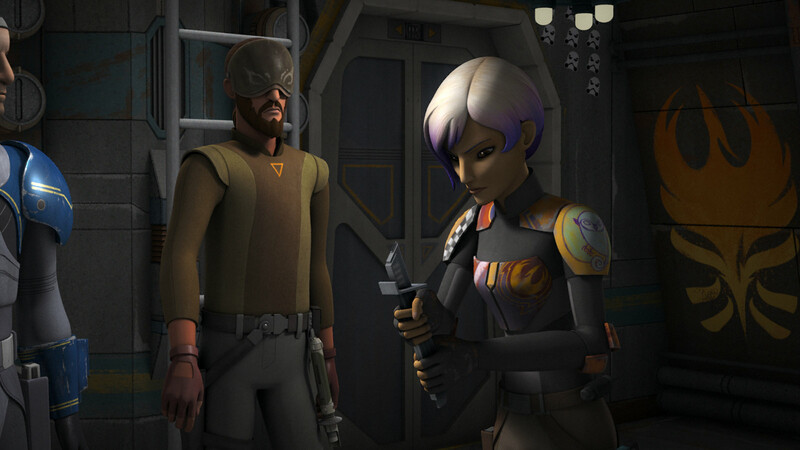 Ezra knows Sabine’s having a hard time and he wants to do…something. 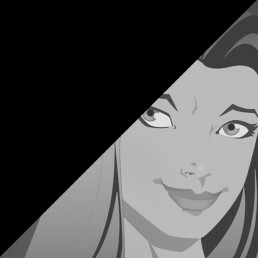 Her defenses, though, are fully in place and she lashes out at him. Ezra wants to help but Sabine doesn’t want to talk about it — or she doesn’t know how. 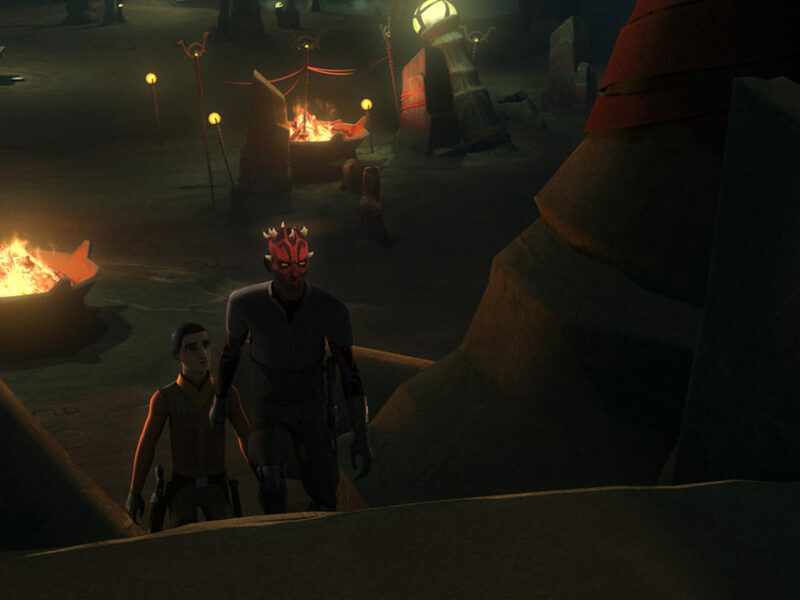 Extra points for stealth Bendu. 5. 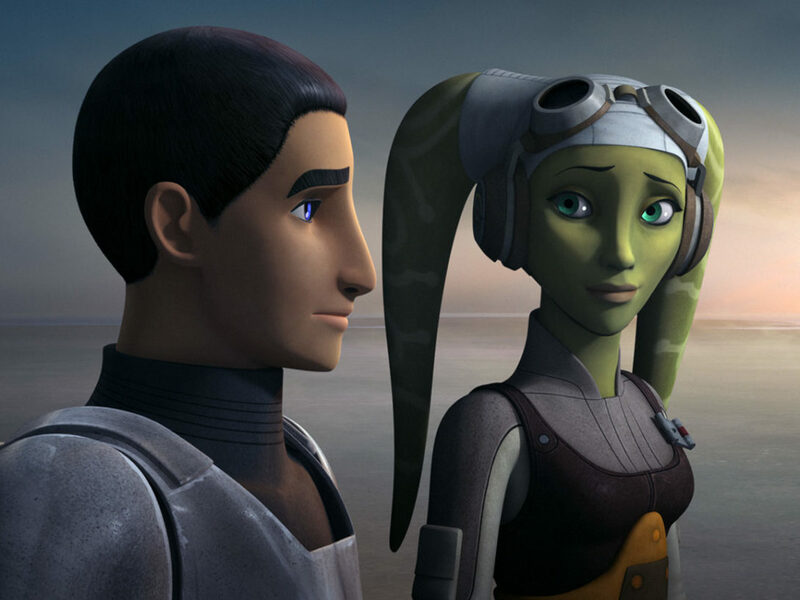 Hera and Kanan talking it out. 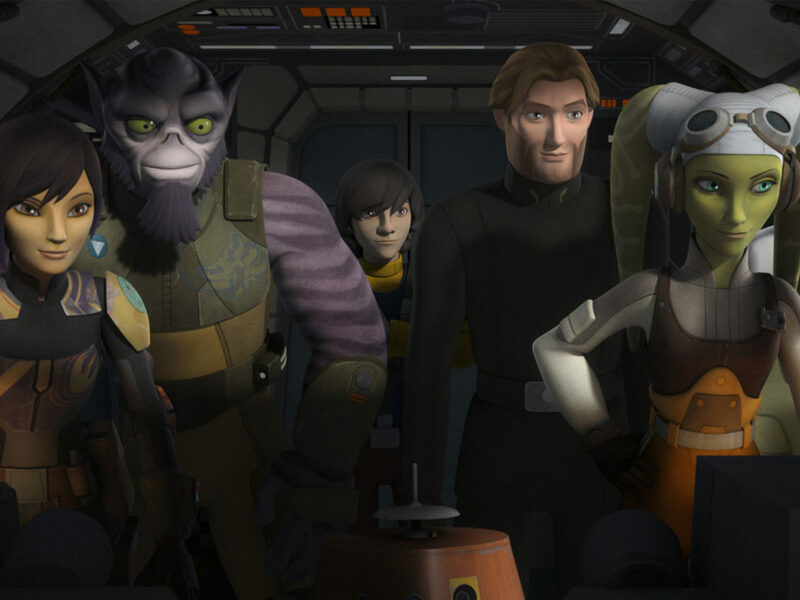 For all his stubbornness, Hera can get through to Kanan when he’s missing the bigger picture. 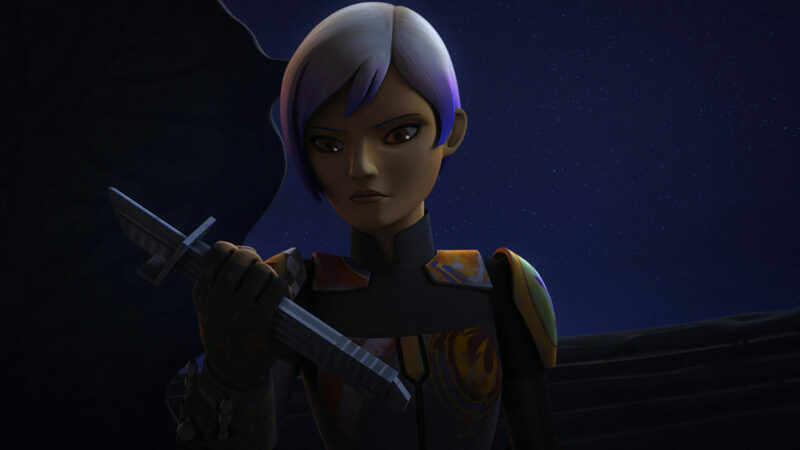 We also get to learn more about Hera’s closeness to Sabine. You can feel the history in how they are together and really feel the level of trust. 6. Apologies, both Jedi and Mando style. 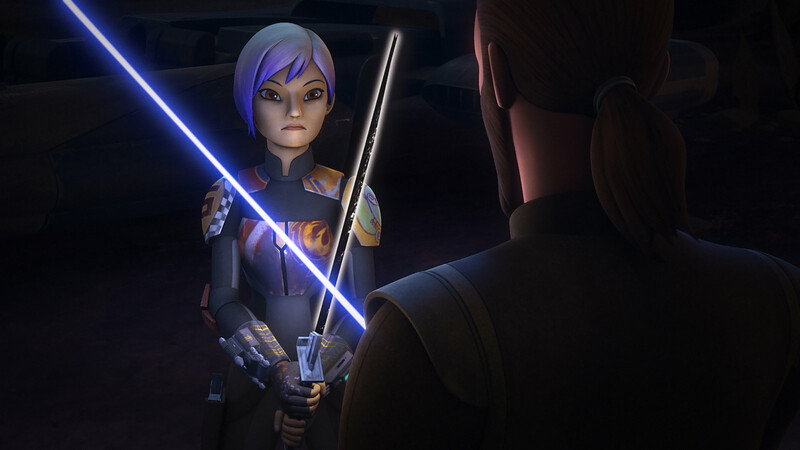 As Ezra and Fenn Rau discuss Sabine from their points of view, both are surprised when Sabine returns and walks directly to Kanan. The mutual apology and quiet acknowledgment of said apology pass without either actually saying a lot, but you feel it. When he stands to hand her the saber, her reluctance and his insistence are a dance of gestures and understanding. 7. 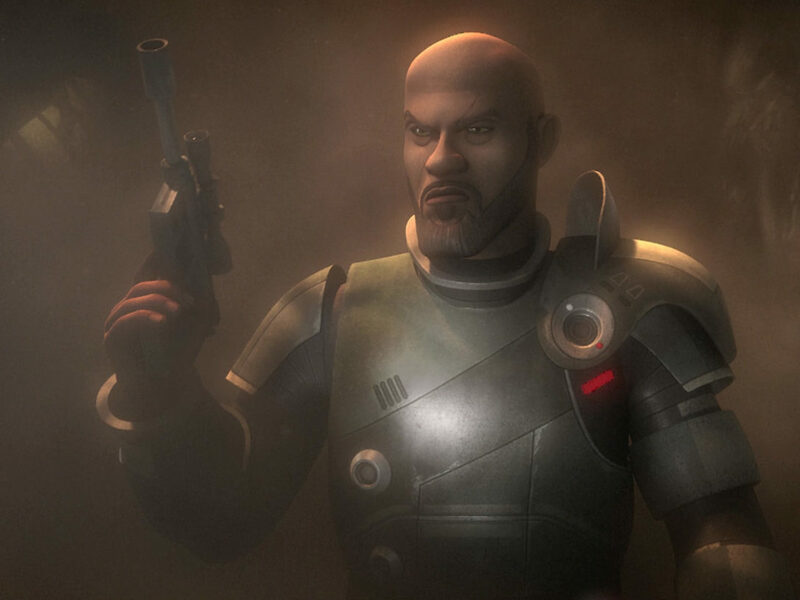 Master Jedi Kanan Jarrus. 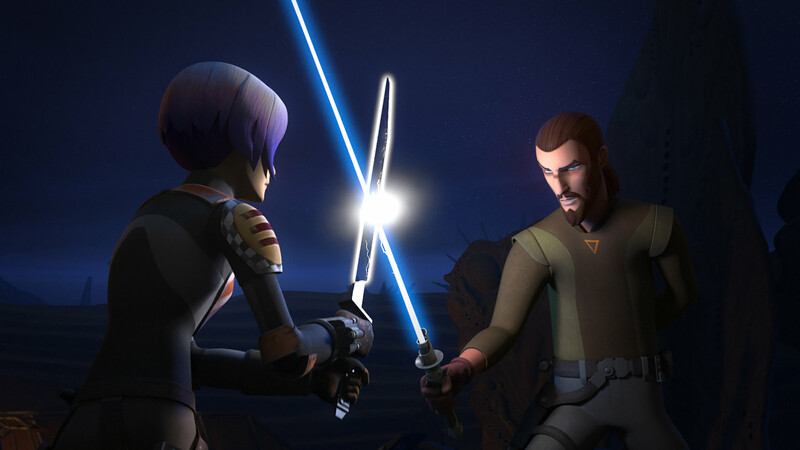 Now that Kanan has given up any concerns, he goes into full master mode and starts training her using sabers. He’s stopped trying to protect her and he’s ready to teach her what she must learn. 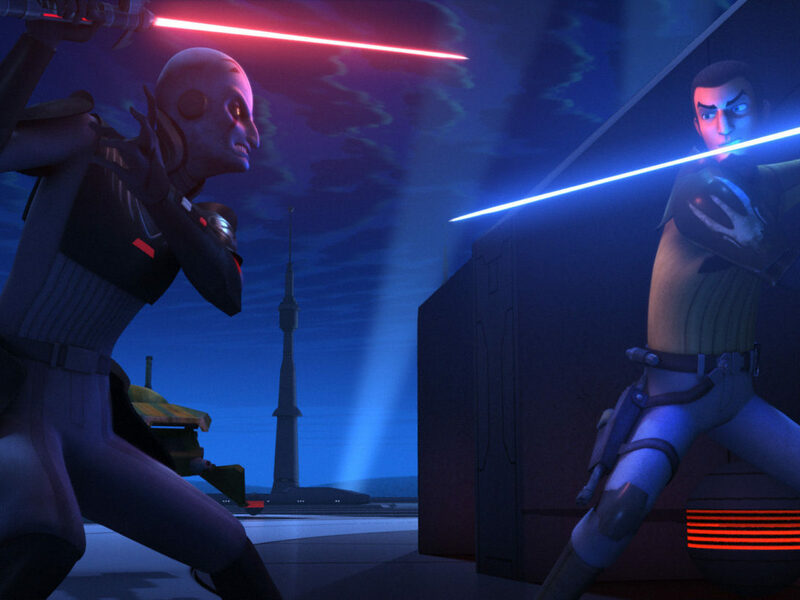 Even though we’ve seen Ezra’s training, this side of Kanan feels like something new, an evolution. Both Fenn and Ezra spectating with such serious interest is also a highlight. 8. Putting the forms to work. 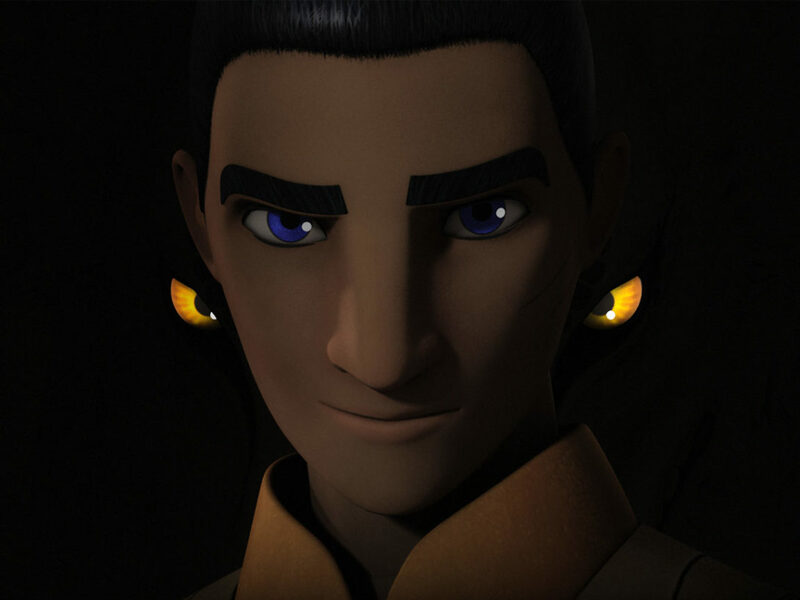 Using the basics he had Ezra teach Sabine, Kanan starts connecting the dots and putting it all to work faster and faster. She starts to get the hang of it, but he’s not done yet and he has a very hard lesson to teach her. 9. Sometimes, you have to push hard for a breakthrough. Unwilling to let her give up or go easy on her, Kanan pushes Sabine harder than he ever has, in search of a breakthrough. 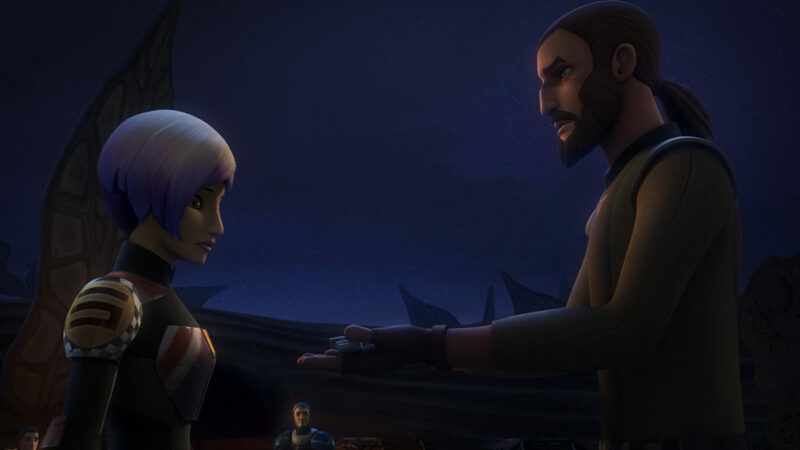 When she finally lets go, we learn about why she left Mandalore and about all the heartbreaking reasons she’s so reluctant to go back. I’ll admit, I cried through the entire scene. 10. Family is more than blood. 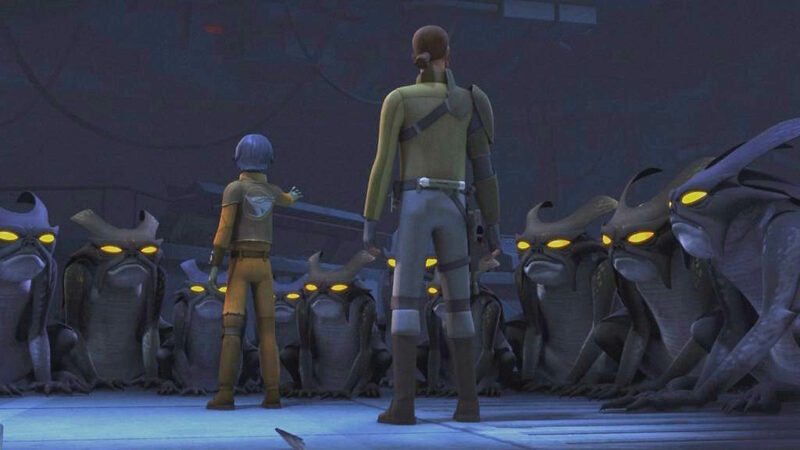 Emotionally vulnerable, Sabine waits for some sort of reaction, but it’s clear she wasn’t expecting Fenn Rau, Ezra, and Kanan to take a knee before her. Watching her warring emotions, especially when Kanan assures her that her chosen family will stand by her no matter what she chooses, left us with a final moment that’ll be hard to top. Those were my moments for this week’s episode. Tell us yours in the comments and may the Force be with you!